When an upright income tax officer receives an anonymous tip about hordes of cash and valuables stashed in the house of a corrupt, power-hungry businessman in Lucknow, he runs a series of raids at the latter’s residence, much to the family’s chagrin. But when there’s clash of egos and beliefs, all hell breaks loose. Raj Kumar Gupta gave us two taut thrillers in the past – ‘No One Killed Jessica’ and ‘Aamir’ – and kept us guessing till the end of both the movies, as to who the mastermind was behind all the proceedings. He succeeded in his effort and was back with ‘Ghanchakkar’ in 2013. Although the Emraan Hashmi, Vidya Balan-starrer wasn’t very well received at the box office, the delightful suspense towards the climax was worth appreciating. 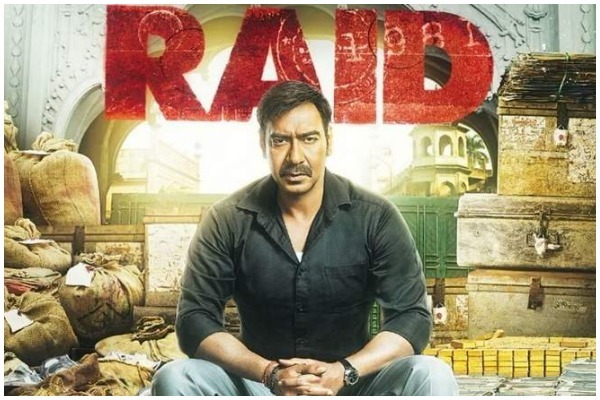 Gupta returns with ‘Raid’, a gripping drama inspired by real-life events, which has all the trappings of a suspense thriller, minus a few thrills. Set in the 80s, the film begins with the story of Amay Patnaik, an honest senior income tax officer, who is often transferred from city to city for being too upright and constantly stirring up hornets’ nests each time he sets foot in a new place, spreading chaos and fear amongst the corrupt, who want him removed, lest they will be exposed. Once when Patnaik is transferred to Lucknow in 1981, he receives a tip from an anonymous caller, stating that the corrupt and unscrupulous businessman Tauji, has stashed insurmountable amount of money and valuables at his residence, which have never come under the IT department’s radar. The onus is now on Patnaik to relieve Tauji of his unchecked belongings. Then on start a series of non-stop raids at the businessman’s house and a clash of egos between the two men, none of whom is ready to give up on his beliefs and step backward. Raj Kumar Gupta’s film is good in bits and parts and he is not consistent in delivering what he promised in the promos. Apart from the one-liners and the heated exchange of dialogues between the two leading men, whenever they come face-to-face, nothing else packs quite a punch. The screenplay is hampered by songs and the melodramatic climax is a bit too stretched. On the bright side, Ajay Devgn breathes life in his character (although he could’ve used a few more expressions!) and plays the fearless IT officer with great ease. He was seen tackling the issue of corruption in a couple of his previous films, but the finesse with which he gets into the skin of Amay Patnaik only adds to his list of best performances. Saurabh Shukla surprises us with his superlative act. He has played negative roles in his films before, but his ever-ranting, sardonic Tauji will earn him more fans for sure. If Ajay Devgn is the heart of the film, Saurabh Shukla is the soul! As for Ileana D’Cruz, she is hardly there! She plays Devgn’s supportive and devoted wife, who does nothing more than pack his tiffin each day and deliver it with all her love, for fear her husband might go hungry, while he is neck deep in work in a different part of the city! The character, without much meat in it, could have been for anybody else’s taking. Amit Sial lends his able support, while the same cannot be said about Gayatri Iyer and the very talented Sheeba Chaddha. Based on real life events of the early 80s, the social drama is relevant in today’s times and it deftly mirrors the facts, where the questionable nexus between corrupt politicians and businessmen have only been on the rise lately. But what the film greatly lacks is the thrill quotient one looks for in a suspense thriller. The story could have been woven more tightly, while keeping the dance and romance routine to a bare minimum. Not only do the intermittent love songs seem out place but they also hamper the screenplay, which could otherwise have been crispier and more gripping. Overall, ‘Raid’ is good with its fair share of negatives, which are definitely hard to miss.